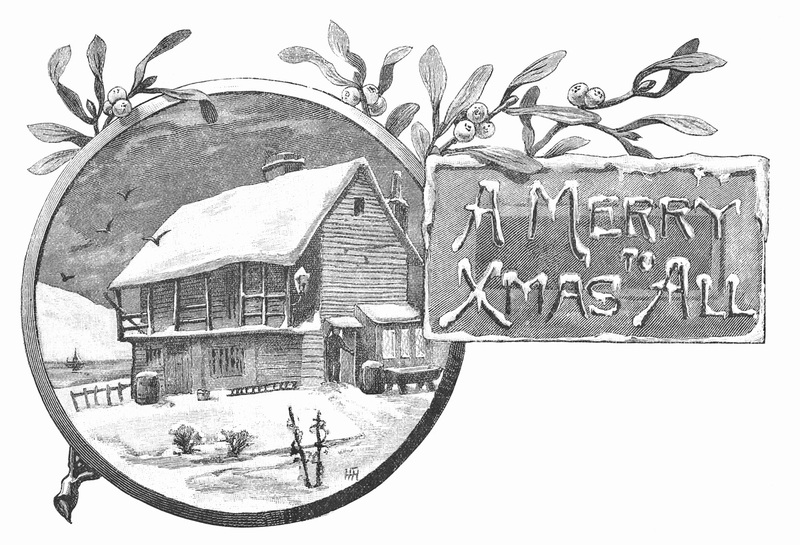 Welcome to the December 2016 issue of our occasional newsletters. Roman archaeology has been one of our long-abiding passions, even an obsession, and as field archaeologists for some three decades, we worked on excavations of several Roman sites in Britain, from rural hovels to villas, towns and fortresses. We even spent our honeymoon on Hadrian’s Wall, and have visited countless other sites throughout the Roman Empire, pored over exhibits in museums and written papers and books on Roman themes. 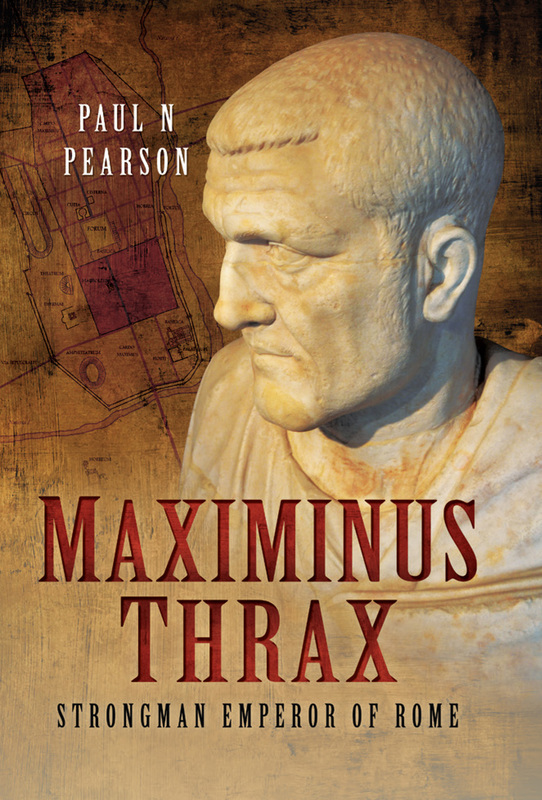 Recently, we were very pleased to be sent a newly published book called Maximinus Thrax: From Common Soldier to Emperor of Rome by Paul N Pearson (Pen & Sword Military hardback, 2016, ISBN 9781473847033, xxiv prelims, 296 pages, illustrations, maps, appendices, endnotes, bibliography and index). Before saying anything more, we must declare an interest. In the dim and distant past, we were involved in an excavation of Beddington Roman villa to the south of London in the days when many unpaid volunteers took part, including several very talented students. One of these is the author of this book – Paul Pearson, who is now Professor of Geology at Cardiff University, and he very kindly thanks us in his acknowledgements for fostering his interest in archaeology and ancient history on this excavation. Paul’s book is the first full-length biography of Maximinus, known as Maximinus Thrax, because he was born in Thrace – probably in what is today Bulgaria. He became emperor of Rome in the year 235 and was murdered in 238. A giant of a man, supposedly over 8 feet tall, he was one of Rome’s most extraordinary emperors. This is not a straightforward biography, but delves deep into the much-neglected history of the early 3rd century AD, drawing on all available sources of evidence and assessing their reliability. The book covers a wealth of topics and is extremely well researched and referenced. It is one of those books where you are not irritated by the clunkiness of the prose or the affectation of the author – instead, the text flows beautifully, making it a joy to read. This is potentially a prize-winning book that deserves to have an extensive readership and to be translated widely. If you are still looking for a Christmas present for someone interested in history, here it is. Our latest magazine article to be published is in Folklife Quarterly 51 for October 2016. It is called ‘I trudge the morning dew…’ and talks about how songs refer to the weather, especially where the labouring classes were affected. When conditions were freezing, market gardeners would often tour the streets begging for money. The FQ website is here. We are giving virtually no talks at the moment because we are too intent on writing our next book, but we do have a talk lined up that will be based partly on our Jack Tar book, called ‘All at Sea in the Time of the Austens’, for the January 2017 meeting of the Jane Austen Society South-West (on the 28th). Two of Jane Austen’s brothers served in the Royal Navy, and her knowledge about the navy is well displayed in Mansfield Park and Persuasion. We are giving our talk in the morning, and after lunch, there will be another talk by Karin Fernald called ‘Fainting Alternately on the Sofa’. This is a very active branch of the Jane Austen Society, and it holds four conferences a year, each one lasting from 10.30am to 3.30pm, with morning coffee, buffet lunch and two talks. The venue is in central Exeter (at Southernhay Hall, Dix’s Field, EX1 1QA, very close to the historic centre). For further details, see here. You do not have to be a member of the main Jane Austen Society to join. 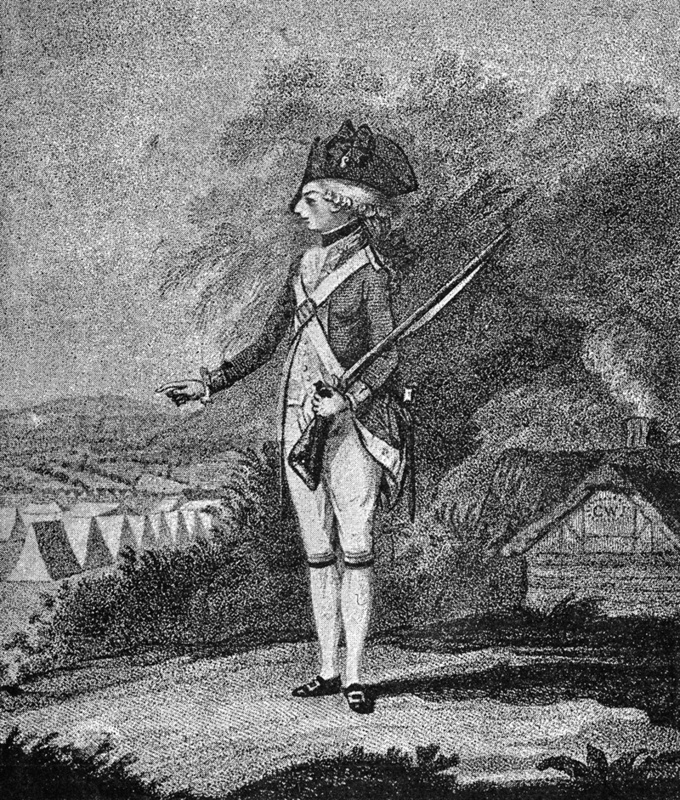 Our book Jack Tar plays a role in a blog post called ‘Nelson’s Floating Menagerie’ (for November 14, 2016). 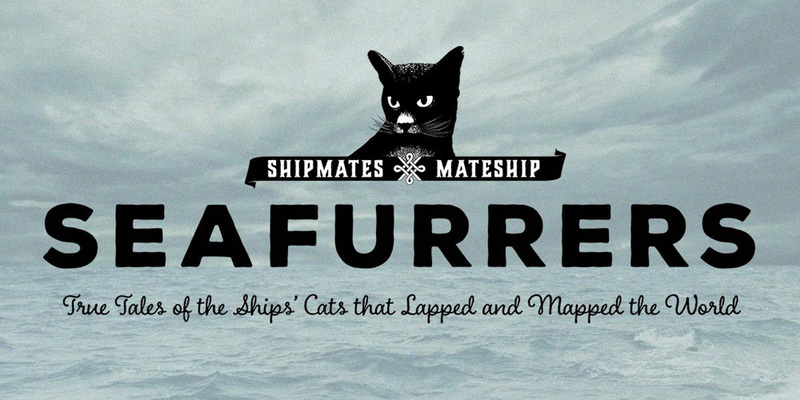 This is a wonderful blog called ‘Seafurrers: True Tales of the Ships’ Cats that Lapped and Mapped the World’, which you can enjoy here. It is hosted by Bart the Cat, though we suspect some human participation as well. It’s very amusing and informative, with lovely illustrations, of interest to cat worshippers and to those (sorry, Bart) who are indifferent to the species. Decimal coinage has been the legal currency in Britain for 45 years, since 1971, based on pounds and pennies (with 100 pennies equivalent to one pound), so that a price of £1.05P means one pound and five pennies. There are still plenty of people who remember a pre-decimalisation time when £.s.d. was the abbreviation for money – pounds, shillings and pence. Of those three letters, only the £ sign (an embellished form of ‘L’) remains in use. The letters L.s.d. developed from Roman times when gold was the basis of coinage, along with silver. The ‘L’ or ‘£’ originated from the Latin word libra (plural librae), meaning a pound in weight (not librum as it is at times incorrectly written). The ‘s’ came from the Latin word solidus (plural solidi), which was a type of late Roman gold coin. 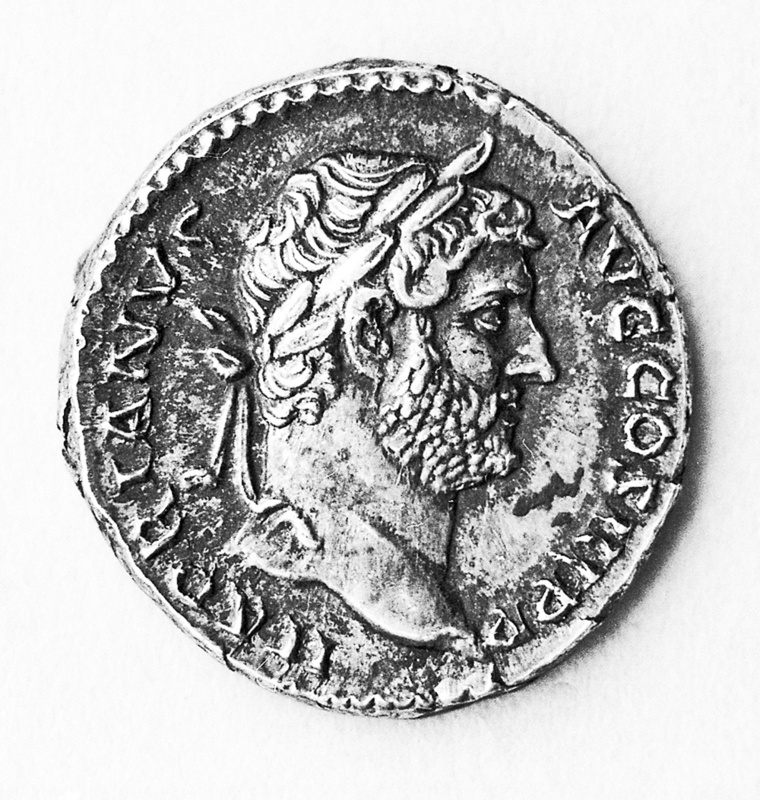 The ‘d’ came from the Latin word denarius (plural denarii), which was a Roman silver coin (see the picture). The value of these Roman coins depended on the amount of gold and silver they contained, and when coins were debased, their relative values changed. With the fall of the Roman Empire in western Europe, the use and minting of coins were disrupted. With gold in short supply, most coinage systems in medieval Europe turned to silver, and the penny was the main coin, with 12 pennies (or denarii) being worth one solidus (or shilling), while 20 solidi were equal to one libra (a pound of silver). For centuries throughout Europe, one of the biggest complaints was the lack of ‘small change’, which gave rise to low-denomination tokens being issued by private traders, although base-metal coins eventually came to be minted. Pounds shillings and pence were used in Britain until 1971, but the coins underwent many changes over the centuries, including both gold coins and base-metal coins, as well as the introduction of banknotes. When people saw ‘£.s.d’, they did not equate them with alphabetical letters, but automatically thought ‘pounds, shillings and pence’, or simply ‘money’. The chromed tin coin holder in this picture was intended to keep coins safe. Dating to about the 1920s, it tells a fascinating story. In the decades before decimalisation, coins were worth substantially more than today, with beer between one and two shillings a pint, and a loaf of bread costing under a shilling. Nowadays, real money means banknotes, but for much of history, coins were not just ‘small change’ but represented significant value and were treated with respect. 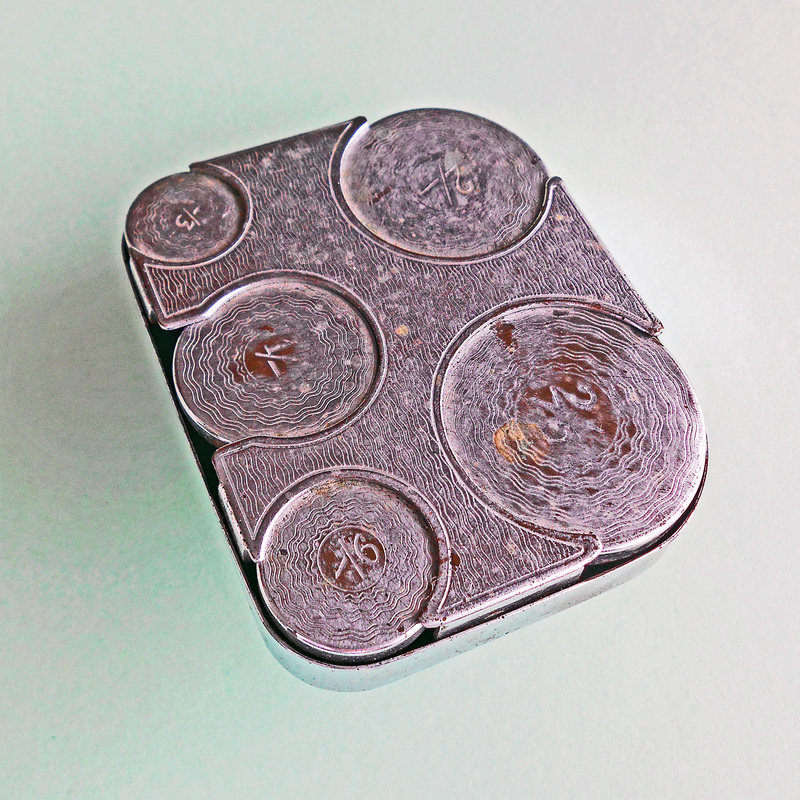 The holder has five spring-loaded compartments into each of which two or three coins can be fitted. They are marked 2/6 (two shillings and sixpence), 2/- (two shillings), 1/- (one shilling), -/6 (sixpence) and -/3 (threepence). The abbreviation ‘/’ is a symbol for ‘shilling’, which is said to be derived from the long ‘s’ (the one that looks like an ‘f’ in old manuscripts and books). The dash is a symbol for ‘nothing’, so that -/3 actually reads ‘no shillings and three pence’. The holder is intended for silver (or debased silver) coins – there are no compartments for the lower-denomination copper penny, halfpenny and farthing. In the late 1930s, silver threepenny coins were gradually withdrawn after the introduction of larger nickel-brass threepenny coins with 12 sides. When decimalisation was introduced, nobody quite knew how to pronounce the coinage. In the old coinage, the word ‘pence’ was generally used as the plural of penny, but the pronunciation ‘pee’ began to be used for the decimal penny, so that the two pence coin was called the ‘two pee coin’, and something priced at five pence was ‘five pee’. With the old currency, half a shilling was a sixpence and half a sixpence was threepence. 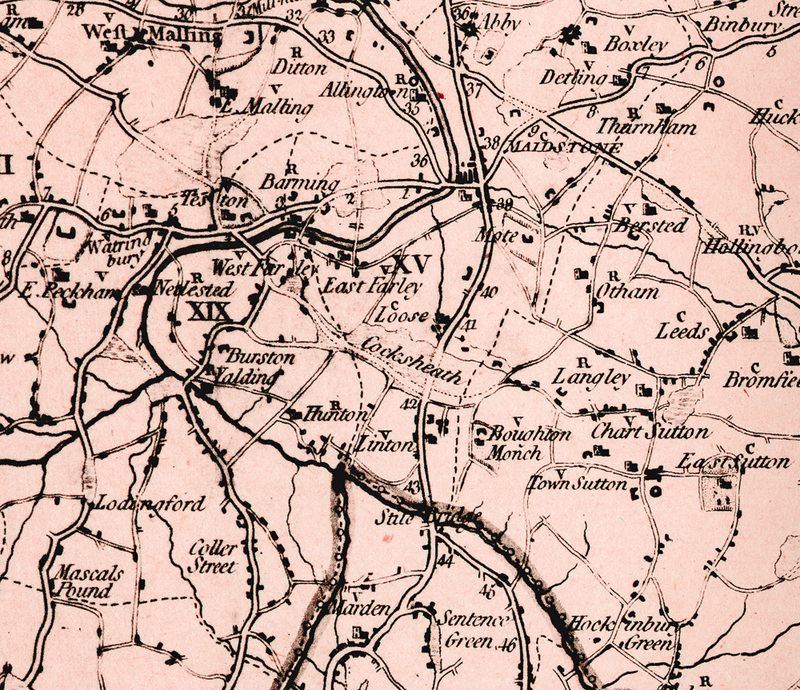 The pronunciation depended on a person’s dialect, so ‘threepence’ might sound like ‘thruppence’, ‘threppence’ or ‘throopence’, and the coin itself was a ‘thruppenny bit’ or a ‘threppenny bit’ (but might be pronounced ‘throopnee’). Twopence became ‘tuppence’ and a halfpenny was a ‘ha’penny’, pronounced ‘haypnee’. A penny with a halfpenny (1½d) were ‘three ha’pence’. A farthing was a quarter of a penny. Coins also had various nicknames, so that a shilling was a ‘bob’, 2 shillings were 2 bob, and so on. Banknotes were sometimes colloquially called ‘folding money’ to distinguish them from coins, and the lowest-denomination banknote was the ‘ten bob note’ – 10 shillings (half of one pound). Two shillings and sixpence (2/6 or 2s 6d) was called ‘half a dollar’ or more commonly ‘half a crown’ or a ‘half crown’, because the old crown coin had a face value of five shillings. Now crowns are only minted to commemorate special occasions, and they have a value of £5. Five shillings was also called ‘five bob’ or a ‘dollar’, a nickname that supposedly harked back to the days when one US dollar was valued at 5 shillings sterling. Two shillings was ‘two bob’ or a ‘florin’ (a name that had once been used for a medieval gold coin of much higher value) and sixpence was a ‘tanner’. Coins below the value of threepence were made from a copper alloy and were often referred to as ‘coppers’. On top of all the names of the coins and a range of nicknames was the added complication of a non-decimal system, because there were 240 pennies to the pound – or 20 shillings or 10 florins or 8 half crowns. There were 12 pennies to the shilling and 30 pennies to the half crown and many more complexities. Many prices were in guineas – for example, one guinea was £1 1s and two guineas were £2 2s. All this made ‘knowing your pounds, shillings and pence’ almost a separate branch of mathematics, while attempts to calculate or compare prices in shops was often a trial of mental agility. From their earliest schooldays, children were taught ‘their pounds, shillings and pence’. Decimal calculators, when they became available, were of little use. Schoolchildren today may well be relieved in mathematics that they are working with a decimal currency – but only if their history lessons have taught them the rich and complicated diversity of the currency that preceded it. Early bells were hung from an axle or spindle to which a rope was attached, allowing the bell to toll, but giving no control for anything else. To make the task easier, a quarter-wheel and then a half-wheel were attached to the spindle, so that the rope could be passed round a groove, making it easier to pull. This still gave no great control of the bell, not until the introduction of the whole wheel and stay (as in the picture). This new method of hanging developed from the 15th century, and it allowed the bell to swing through a complete circle and back again. From the resting position, with the bell hanging downwards, successively stronger pulls on the rope made the bell swing higher and higher each time. With the bell swinging through a wide circle, a pull on the rope with the right amount of force caused the bell to turn upside down. As the bell went just past the vertical, the wooden stay hit a sliding piece of wood (obscured by the bell in the picture), bringing the bell to rest. From this resting point, a pull on the rope would bring the bell down, causing it to swing almost up to the vertical in the opposite direction. Each time the bell swung, it would sound, but once it came to a stop, upside down, it was silent. With this innovation, a bell could be slowed down or speeded up by the bellringer’s force and timing in pulling the rope, and the bell could be easily stopped and started again. 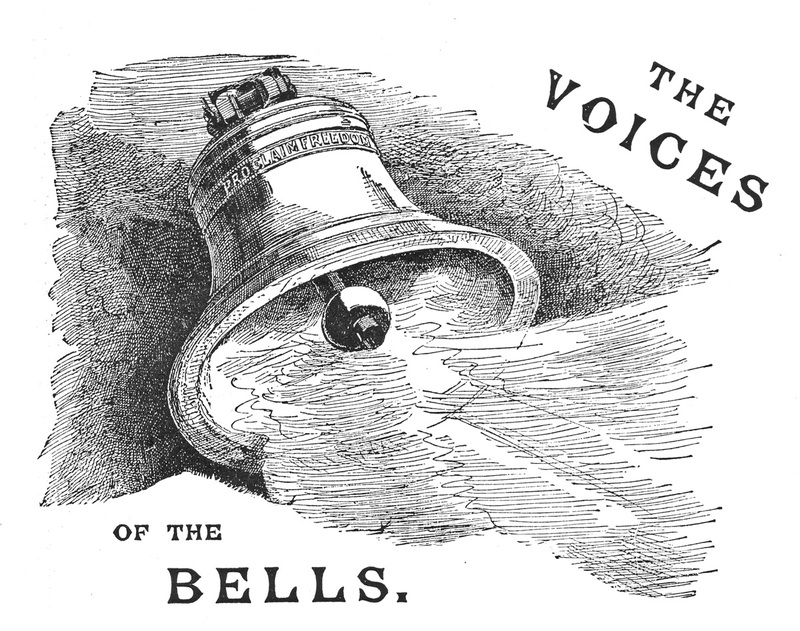 This new ability to control a bell allowed the introduction of change ringing with a set of bells. 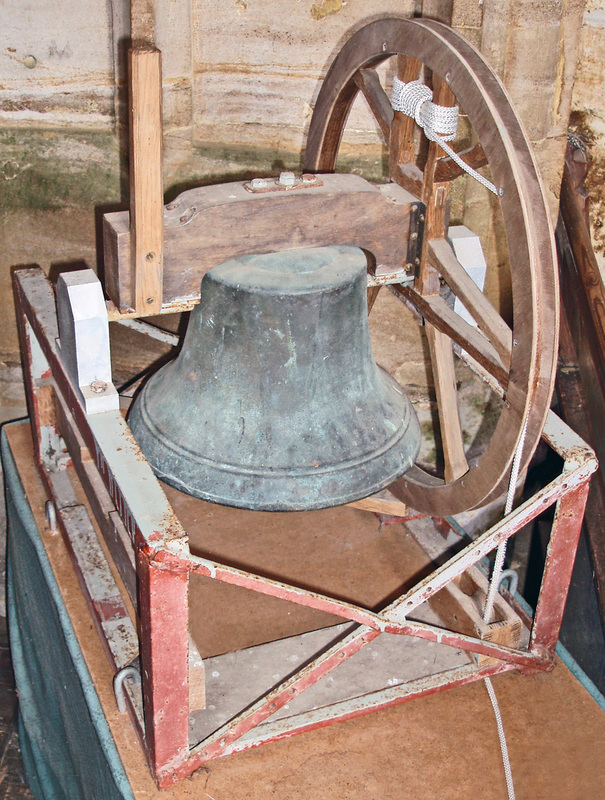 Instead of ringing one bell after another in a constant round, the order in which the bells were rung could be changed and changed again during the ringing, to produce a distinctive musical effect. This became popular from the beginning of the 17th century, and it was not long before a Cambridge printer, Fabian Stedman, saw the great possibilities of the new method. 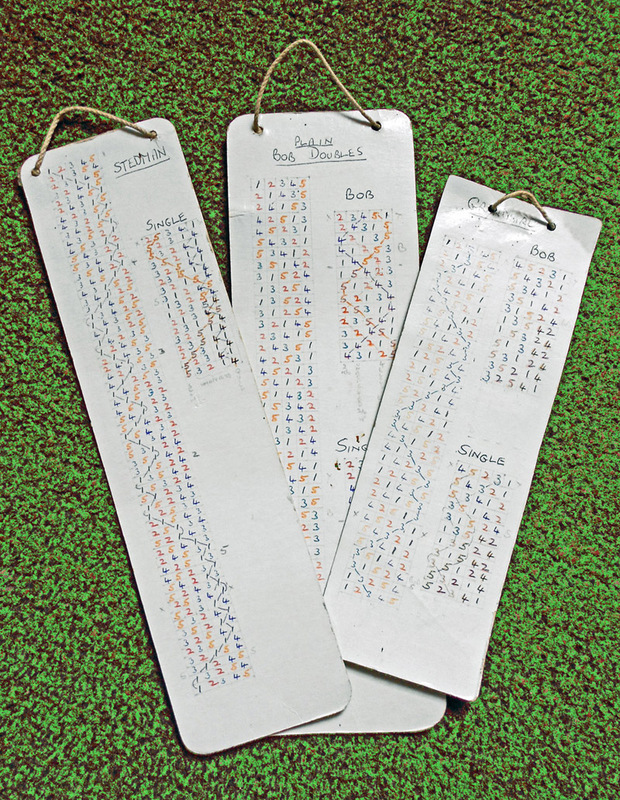 Using mathematics to work out the possible combinations of bells, he realised that six bells (a number that many churches had) could be rung in 720 different combinations before a repetition was necessary. With more bells, the number of combinations (or ‘changes’) rose dramatically. In 1668 Stedman published Tintinnalogia and in 1677 Campanalogia, which set out his new system. From that point, change ringing developed.